Sulawesi society in common and minahasa people especially, practiced a motto in their daily life. The motto is “Torang Samua Ba’saudara”, which means, “we’re all family”. This motto also reflected in a tourism object which has been famous abroad. The tourism object is spiritual tourism hill, a hill which located in the food of Soputan mount, called “Bukit Kasih” (Love Hill). This hill is named “Bukit Kasih” because people from different religions can gather and have a peace at this place. From the motto that owned by Sulawesi people, “Bukit Kasih” is a symbol of peace. Besides, it’s also a place which reminds us to religion harmoniousness. In top of “Bukit Kasih”, you will find 5 praying places from 5 religions in Indonesia, which are mosque (Islam), church (catholic and Christian protestant), vihara / Budhist monastery (Budha), and temple (Hindu). Those five praying places are linked with an access of stairway. Those places which linked in highness represent that any religion member can live peacefully in a harmony. This place is a final of trip to “Bukit Kasih”. 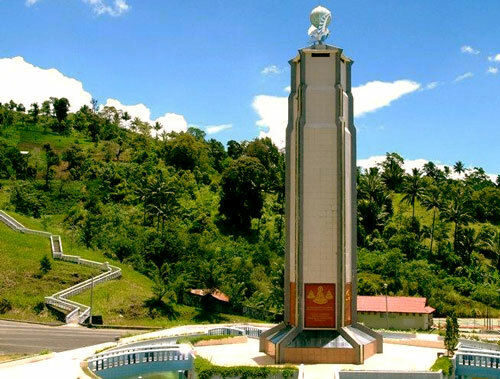 Near the entrance door of this tour complex, you will see a monument with 55 m high, called Tolerance monument. It called Tolerance Monument because it shaped pentagonal and in each side there’s picture carving, symbol, as well as quotation from each religion holy book. The same as in praying places in top of ‘Bukit Kasih”, Tolerance Monument is also shows pictures and quotes from each of religion. Tolerance Monument is a symbol of reminder that religious members should live in tolerance. 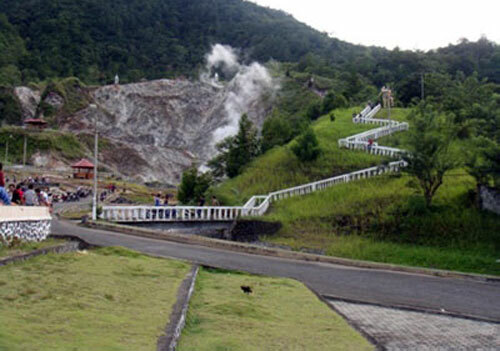 “Bukit Kasih” tour area is located in sulfur source area. So when you’re walking, you’ll see some calderas. As an addition, the scenery in this hill is really lovely. You will see some green hills surrounding this place. From Tolerance Monument to “Bukit Kasih”, you will find stairs available for you. From distance, you can see the shady hill, and the five praying places in top of it can also be seen. You will also find a huge face carving in the hill’s wall that can be seen from remote. 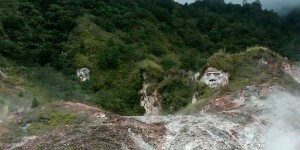 The face carved in the hill’s wall is a face of the Minahasa’s ancestor, Toar and Lumimuut. 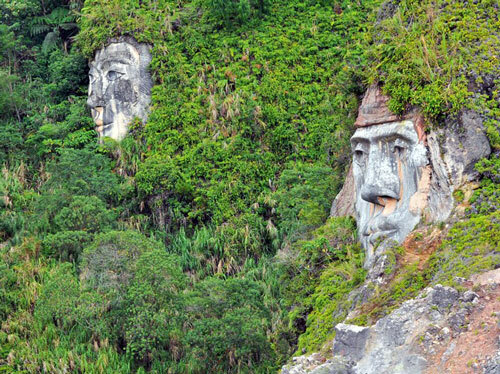 This face carving is meant that Minahasa people shouldn’t forget of their ancestors. The stairway to top of “Bukit Kasih” is looks like ‘small Chinese great wall’, if you see it from above. In some spots, the stairway will pass sulfur caldera, so you can see sulfur pools in left and your right side. As info, the stairway route to top is quite long and exhausting. Beside a good stamina, you suggested to wear comfortable and safe shoes. Though the trip to the top is quite sloping, but it’s worth it once you get on it. The magnificent view will sweep your tired away. 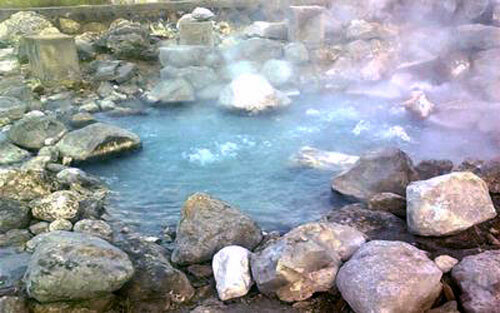 In top of “Bukit Kasih”, you can also find some hot water pools in small size. It’s enough to soak your feet in it after a long trip. While you’re soaking, you can enjoy the surrounding green view which is shady with many trees. The landscape view is also lovely, and even more if you see it in dawn or dusk. From top of the hill, you can also see the blue Tondano lake. In one of the praying places, you can spend sometime to pray. Here, you can pray with people from different religion, where we will remember that “Torang Samua Ba’saudara”. 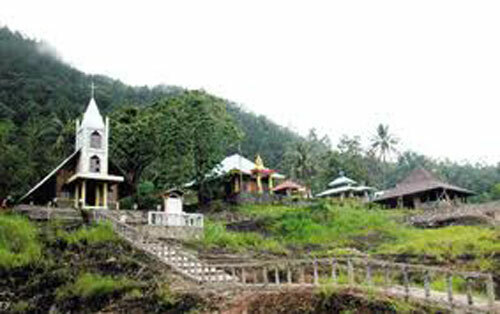 Bukit Kasih religious tourism object, is located in Kanonangan Village, Minahasa district, Nort Sulawesi. its about 55 km in south of Manado city. From Manado city, “Bukit Kasih” can be reached with public transportation in an hour. “Bukit Kasih” has some accommodation and facilities, such as food stalls that provide snacks, and some natural hot water pools. For you who want to spend the night, some hotels near Bukit Kasih, you’re recommended to stay at hotels which available in Manado city, such as Novotel Manado Golf Resort & Convention Center and Sutanraja Hotel Convention & Recreation.